You may have already heard some buzz about the Tapped pop-up beer gardens that have been, um, popping up around Pittsburgh. If you haven’t, it’s a really simple concept: Tapped is a showcase of local innovators, food trucks, community groups, and breweries; a super-casual afternoon of beer, music, food, and lawn games. Tapped events have already occurred in the Strip District, Downtown, and Larimer. 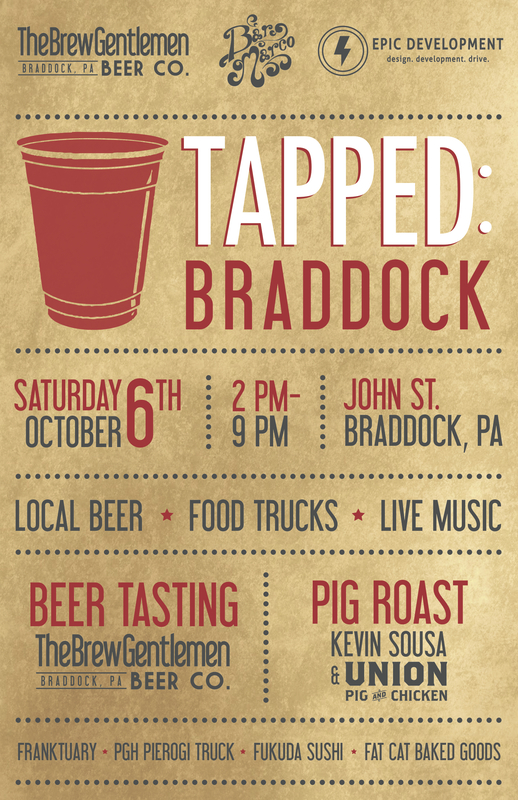 Tapped: Braddock is set to be the grand finale of the Tapped 2012 series. We’re working with Epic Development (blogger/organizer), Bar Marco (cocktail and wine aficionados), Mayor John Fetterman (Braddock’s badass mayor), and Kevin Sousa (chef/owner of Salt of the Earth, Union Pig & Chicken, and our forthcoming upstairs neighbor, Magarac) to put together an event that can hopefully re-introduce Braddock to a lot of people. We will be hosting a beer tasting with both White Sky and General Braddock’s IPA. Kevin Sousa will be doing a pig roast. Bar Marco will be grilling burgers and making craft cocktails. Food trucks will be providing all measure of mobile cookery. Pingback: 10/9/12: Festivals, Festivals, and well, Festivals | Fukuda.